Look how happy this dog is! Last week, there was a disturbance in Denver’s zen and the outcry was swift and severe. It all went down when city inspectors informed Prost Brewing Co. that they were violating city laws by allowing dogs inside their brewery. The statute came as a shock to most as dogs have become as ubiquitous as beards and UnTapped check-ins at brewhouses across the city. Apparently though, canines have never been allowed in breweries. The city simply didn’t have the resources to enforce the ban over the last five years. The first violation results in a warning with subsequent violations leading to fines. Within hours, signs outlining new dog policies were posted at entrances to taprooms and a petition was created to “allow dogs back into Denver breweries”. The kerfuffle basically boils down to semantics. The health department considers beer to be “food” and therefore breweries face the same restrictions as restaurants when it comes to our four-legged friends. Though beer was once considered liquid bread and safer to consume than water, I don’t recall seeing it featured on the food pyramid so a re-classification may be in order. While the issue remains somewhat unresolved in the eyes of dog-owning beer enthusiasts, Fido is still allowed on city-approved patios. Remember back in 2000 when Comedy Central aired BattleBots? It was basically custom robots built with the sole purpose of destroying other robots. Not unlike what our future will look like, only these kill machines will be hunting and destroying the human race. Get a jumpstart on building your defense mechanism at Little Machine every Tuesday, leading up to the ultimate Robot Riot on July 10th. No prior experience necessary! Wednesday, May 25, 2016 @ 6 – 9pm: Beer + Pie Pairing at Black Shirt Brewing Co.
Black Shirt and Long I Pie are at it again with a four-course pie + beer pairing. For $20 (plus tax + tip), enjoy four professionally paired slices and pours with both sweet and savory options. View the full menu here. Join PorchDrinking.com and their friends at General Assembly Denver for a panel discussion on how innovation is shaping the craft beer industry. The panel will touch on how data is influencing production and consumer buying trends. Guests will also hear how tech is making it easier to brew as well as purchase craft beer. Attendance is free and beer will be provided for attendees 21+ but please RSVP to reserve your spot. Bread-N-Butter specializes in Southern food, whiskey, and bourbon. This Friday they’ll be hosting Laws Whiskey House for some rare pours of their stock. Sample the Cask Strength Rye Whiskey, Wheat Whiskey, and a never-before-released version of their Bourbon. River North recently reopened in their massive new facility way up the river and though they missed their actual anniversary, they’re still gonna mark the occasion. The raison d’etre will be the release of Anniversary Ale 4 ¼, an Imperial Saison aged in Manhattan cocktail barrels. It will be on tap and available in 375ml bottles for $10. Saturday, May 28, 2016 @ noon: Sobremesa Tap & Bottle Release at Copper Kettle Brewing Co. The first offering in Copper Kettle’s 2016 barrel-aged series is ready to be tapped. Sobremesa is an 8.1% ABV English Strong Ale with lime and agave, aged in tequila barrels. It will be available in 22 oz. bottles and on tap. Pavlo’s Taste of Ukraine will be on-site with the grub. A new beer festival to throw on your calendar is the Funk & Farm Fest up at Nighthawk Brewery in Broomfield. Featuring Grisette, Saison, and farmhouse style ales from a plethora of Colorado breweries. Tickets run $35 – $45 and come with commemorative glass, food and goat cheese from Haystack Mountain. Here is the list of beers available at the fest. While you won’t be able to bring your dog into the brewery, you can leave him/her to get a bath with capable strangers while you head in for refreshment. 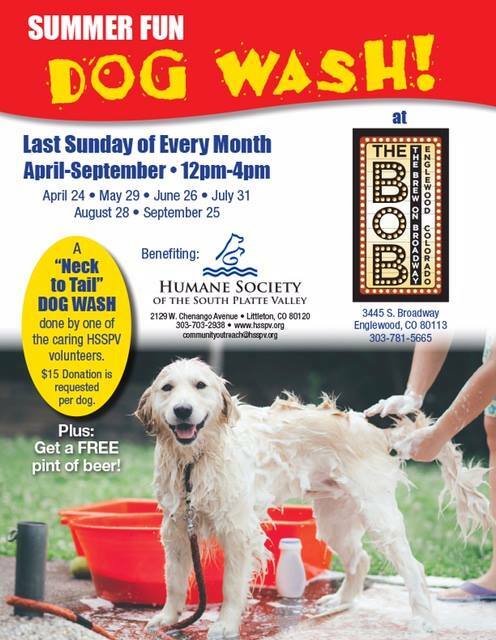 $15 gets your furry friend a wash and you a cup of coffee or pint of ale from The BoB. This event benefits the Humane Society of the South Platte Valley and will repeat on the last Sunday of every month through September. Don’t make the mistake of heading into work today – it’s Memorial Day, dummy! Head over to Ratio instead where they’ll be serving up $4 Domestica and $5 Dear You while Lucky Pie cooks up brats and burgers on the grill. No cover.